Published: Sunday, June 15, 2014, 9:00 p.m. It was hard not to feel the joy radiating from every corner June 14, when two young lives were brought together in holy matrimony, surrounded by an assemblage of family and friends. Angela Anne DiGioia and Michael Paul DeVanney celebrated a nuptial Mass at St. Paul Cathedral in Oakland on the bright and beautiful day that seemed tailor-made for the occasion. During the Liturgy of the Word, readings encouraged God’s commandment to love one another (John 15:12-16) and to hold marriage in the highest honor (Hebrews 13:1-4A, 5-6B), elements key to keeping a union on a firm foundation no matter what trials or tribulations may present themselves. The Rev. Christopher Donley gave the homily. After the ceremony, guests arrived at the DiGioias’ historic Shadyside home for the reception. There, the grounds had been transformed by white tents for dinner and dancing, flawlessly presented by The Event Group’s Sheila Weiner. Embodying a welcoming atmosphere that managed to be elegantly opulent without ever losing its effervescent vibe, the space glowed under crystal chandeliers and soft candlelight. 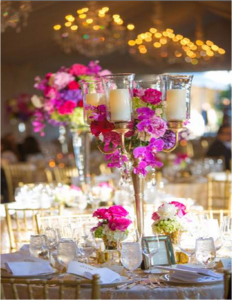 Tables were adorned with towering centerpieces of abundant blooms from Hepatica — hydrangeas, peonies, orchids and roses in vibrant pops of purple, pink, red, fuchsia and white, while the Duquesne Club presented a multi-course meal of beef tenderloin and Virginia spots. The bride (in Vera Wang) and groom enjoyed their first dance to “Your Song” by Elton John, performed by the band Nightsong, while a burst of camera flashes captured the moment. The newlyweds will enjoy a honeymoon in Bali. Among the wedding party were parents of the groom, Kevin and Nancy DeVanney; maids of honor and sisters of the bride Maria and Noelle DiGioia; bridesmaid Allair DeVanney; best man David Donley II; groomsmen Peter Baird, Matthew DiGioia, Thomas Freyvogel III, David Onufer, Clay Shaffer and Matthew Swanson; flower girls Atia DiGioia, Chaya DeVanney and Antonia Linzoain, who all wore dresses personally made by their Nanna, Shirley Amodeo; and ring bearers Gideon Deasy, Holden Deasy, Romeo DiGioia and Pablo Linzoain.